The other day, Cathy bought some motorcycle gear: jacket, helmet, gloves and overpants. We got such a good deal at Road Rider, I was able to get myself a new helmet. I had no real complaints re: my old helmet, but as it is a flip-face, the convenience is offset by the fact that it has less chin protection in a crash. Also, the new helmet is much better ventilated, and is overall a better made helmet! 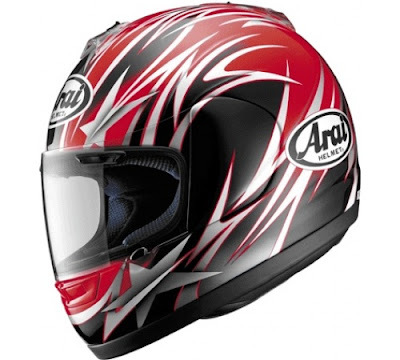 Behold the Arai Quantum-2. The pattern is called "Stellar Red".